The straight fused piecing I talked about last time is fused and quilted, but not quite finished. After buying silk organza, silk gauze, and silk crepeline, I chose not to use any of them because they took the tones down too far. I thought the crepeline would work because it is the most transparent (also very expensive! ), but it has a distracting sheen that was too much for an overlay on the whole piece. All this silk and what to do with it? I bought a package of Angelina fiber a while back to possibly use on some butterfly art. 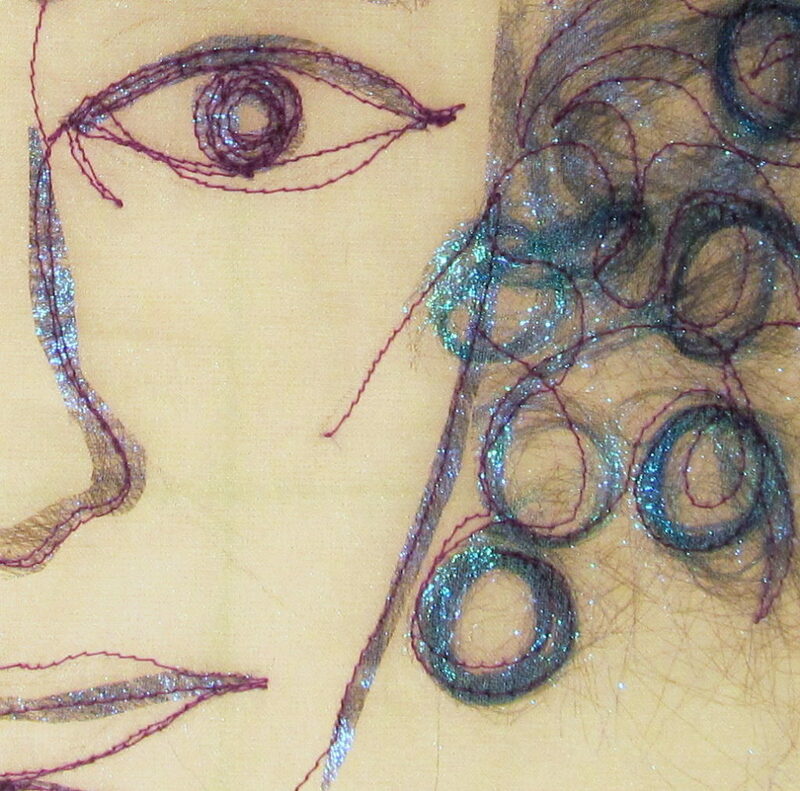 As you can see I began to cut up silk gauze and play with the Angelina. Thanks to Floris Flam’s suggestion to use Solvy when I asked questions about silk, I arranged Angelina on the gauze, spritzed it with water, added a sheet of Ultra Solvy, spritzed it again, and then laid down another sheet of gauze. I smushed this all together carefully and let it dry before stitching on it. It came out of a careful bath very soft and flowy, and doesn’t appear to be warped or pulled in any particular direction. I ironed it when it dried and the Angelina fibers bonded. Very nice, except – it was hard to control the Angelina while designing this face. So I started over with a piece of silk organza. I followed the directions for bonding the Angelina together and produced a nice “sheet” of it to cut apart and then laid pieces on a leftover piece of Mistyfuse on top of the organza. While I was happy with the design (well – as happy as one can be if you don’t usually draw people), I found it equally hard to control the Angelina this way because it kept catching on the Mistyfuse. Maybe it would help to bond the Mistyfuse to the silk first and then design. It also would have helped to pin down or put some weight on the edges of the silk so it didn’t move. I added a piece of silk crepeline on top and bonded the whole piece with a quick iron. The crepeline really did help the Angelina fiber show through. This time, I put Ultra Solvy underneath and a sheet of regular water soluble stabilizer on top and put it all in a hoop before stitching. No spritzing, I’m pretty sure spritzing was not something Floris was thinking about when she suggested Solvy. I was not happy with the Mistyfuse after this gal’s bath. 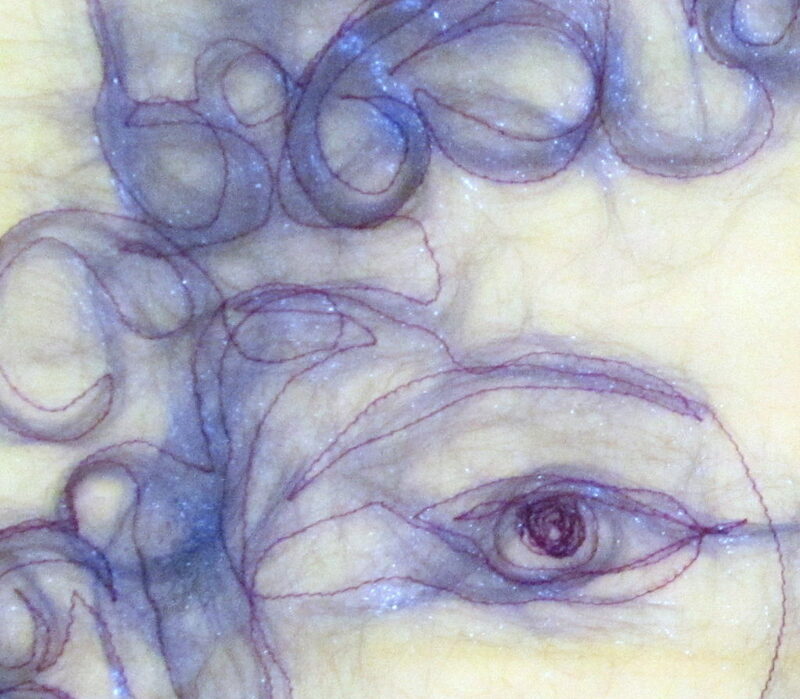 The whole piece is much crisper because of the organza, but the Mistyfuse lifted off the silk and is just hanging there at the bottom of the face. I did not wash the silk first, so maybe there wasn’t a bond. Or it could be because I adjusted the iron heat down for the Angelina. Of course I didn’t cut a piece large enough to cover the whole piece of organza, who would have thought of that? If there’s going to be a disturbing texture, better that it is consistent throughout the whole thing. I will trim it away from the face before I finish. The prior experiment looks much nicer without the Mistyfuse, which added texture I don’t really like in the second piece, so the first gal can be hung by herself in a sheer way, perhaps after adding an organza “backing”, but this second gal will be quilted onto a cotton background in a more traditional fashion. Thanks to my drawing skills and the imprecise control over the Angelina, both of the girls are hideous in their own special way, but it is so exciting to play with silk and Angelina, I can’t help loving them!